If you shave your head, you may develop unsightly bumps on your scalp. These bumps, often referred to as hair bumps or razor bumps, are more likely to appear on individuals with curly or coarse hair. The hair grows back into the skin and results in an inflamed, raised area. Although allowing your hair to grow out can naturally cure the condition, if that's not an option you prefer, there are other methods you can use to heal your hair bumps. Clean and dry the scalp. Before applying any type of treatment product, the area should be cleansed with a mild soap and patted dry. Release the ingrown hair with a sterile needle. A sterile needle can be inserted beneath the loop of the ingrown hair and lifted to release the tip of the hair from the skin. Treat the hair bumps with a glycolic acid-based lotion. Choose a lotion with an 8 percent concentration of glycolic acid. Apply the lotion twice a day to treat razor bumps, recommends Discovery Health website. Reduce inflammation with a topical steroid. Cortisone cream can be applied directly to the hair bumps twice a day to relieve inflammation. Discontinue use once symptoms clear up since overuse can cause skin sensitivity. Apply a topical antibiotic to prevent infection. Use the ointment once a day. 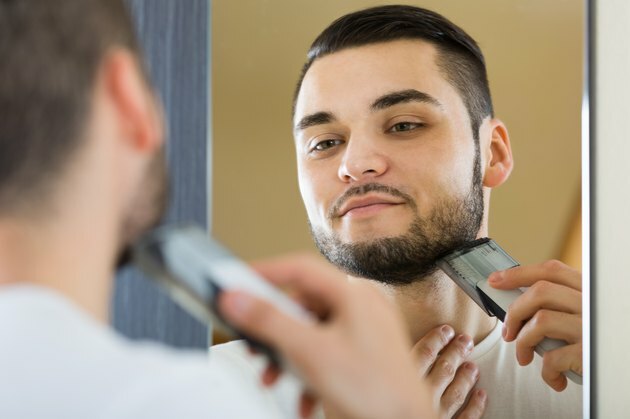 Changing the way you shave can prevent future occurrences of hair bumps. When you shave, wet the area first with warm water and apply an aloe-based shaving gel. Move the razor in the direction of the natural hair growth. Apply a cool compress to the shaved area once finished. If you experience pain or notice any pus around the bumps, contact your doctor since you may have developed an infection. Never squeeze or pop the hair bumps to remove them. Squeezing or popping the bumps can increase your risk of infection.